Forest fires are an annual occurrence in Australia, California and British Columbia, and in the United States and the Caribbean, people live in fear of the next hurricane that could literally turn their lives upside down. Most of us have watched videos of calving glaciers as huge chunks of ice break off millions-year-old ice sheets and tumble into the sea. They have become emblematic of the highly-politicized cause of climate change, or dare we say, “global warming.” Starting with Al Gore's An Inconvenient Truth, the global warming alarmists have been on a decades-long crusade against the fossil fuel industry, but few have stopped to think about what are the implications of climate change from an investment point of view. A warming planet will have a multitude of cascading effects on our resources, and while several examples could be given, we feel the most dramatic will be on our fresh water supplies, and oil operations close to the coasts where higher sea levels could inundate refineries. Rising seas and more frequent storm surges will also have an impact on cities. Some – including New York City – have already started taking pre-emptive measures so that the damage wrought by a natural disaster like Hurricane Sandy is not repeated. Its $1-billion flood prevention plan includes a $332 million U-shaped berm that will hug the Lower East Side of Manhattan. What impacts will rising seas have on urban infrastructure that will need to be built to keep the waters at bay? 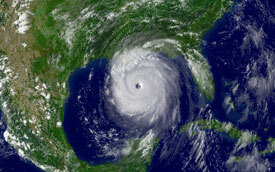 Hurricanes and tropical storms hitting the United States have been increasing in frequency and degree of devastation. Hurricanes Harvey (which mostly affected Houston) and Katrina were the costliest cyclones on record, with Katrina costing $161 billion and Harvey $125 billion in damages mostly from flooding. When Katrina reached landfall it caused a storm surge between 10 and 25 feet, inundating coastal areas across Louisiana and Mississippi. In New Orleans the levees broke and the city was at one point 80% submerged. The National Guard was called in to help and it is known as the largest displacement of Americans since the Great Depression. In 2016 Louisiana was slammed again with massive floods. Thirteen people died, 40,000 homes were damaged and there were 30,000 water rescues. According to the BBC most of the eastern part of the state received 15 inches of rain in 48 hours; the Amite River rose to 46 feet, beating a previous record set in 1983. Between Katrina in 2005 and the Louisiana floods, other recent natural disasters in the US include the 2014 Washington State mudslide which killed 43; the tornado in Oklahoma in which 24 people died and caused $2 billion in damages; flooding and tornadoes in Oklahoma and Texas in 2015; and the 2016 East Coast blizzard which killed at least 45. In Puerto Rico, the effects of Hurricane Maria are still being felt, with nearly half a million residents still without power four months after battering the US island in the Caribbean. Canadians aren't exempt from flooding either. Between 2000 and 2017 there were 80 flood events, with the worst happening in Calgary in 2013. The cost of damage in the town better known for rodeos than sandbags was an eye-watering $6 billion (big for Canada). Last summer eight communities in Manitoba declared a state of emergency due to flooding. Earlier this week, overflowing rivers due to heavy rains, snow melt and ice jams forced 5,000 people from their homes in Brantford and had officials announcing a state of emergency and flood warnings throughout southwestern Ontario. While the floods in North America have been bad and are getting worse, they're eclipsed by what's happening elsewhere. As Texans were worrying about wrecked homes and businesses last summer, heavy flooding in India, Nepal and Bangladesh forced millions from their homes and shut down 18,000 schools. About 40 million were estimated to have been affected by monsoon rains and 1,200 were killed – putting our own problems with floodwaters in perspective. The big question is whether all these extreme weather events are isolated incidents or whether they are all connected to a warming planet. Scientists say they are, even though they can't prove a direct cause and effect. They say over the past 30 years there has been a pattern of increasing average temperatures across the earth. Rising temperatures, either due to natural cycles or human-caused emissions trapped in the atmosphere, increase ocean evaporation and the amount of water vapor in the atmosphere. The result is more intense rain and snow storms, and in dry areas, heat waves and droughts. Seventeen of the l8 hottest years on record have occurred since 2001, according to records dating back to 1880; earth's average temperature has risen nearly 2 degrees F since the late 19th century. The warming of the earth's surface has caused a widespread retreat of the glaciers at both poles. According to NASA between 2002 and 2006 Greenland lost 60 cubic miles of ice; in Antarctica it was 36 cubic miles from 2002-05. All of this melting ice has caused sea levels to rise, from between seven and eight inches over the last 117 years, NASA states, with the most rise occurring since 1993. The expansion of ocean water as it warms also causes higher sea levels. The latest International Panel on Climate Change report predicts sea levels rising between 52 and 98 centimeters by 2100 if nothing is done to stop rising temperatures. An increase of 65 centimeters, or roughly two feet, is expected to cause significant flooding in coastal cities. 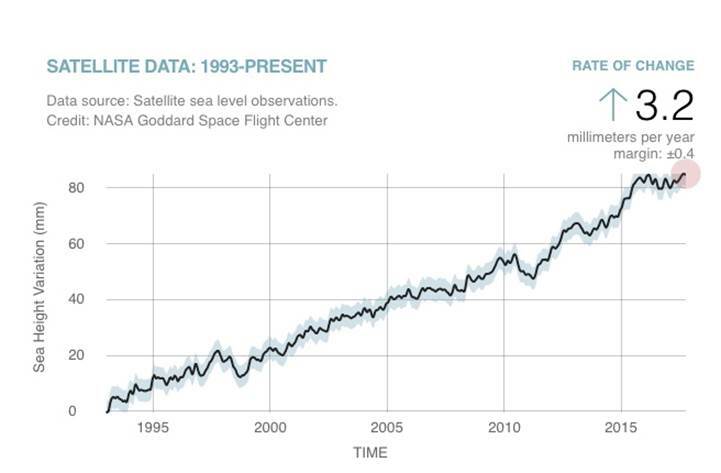 Satellite images show sea levels rising 3.2 millimeters a year, with the last measurement, taken in October 2017, recording a rise of 84.8mm. What would happen if the earth warmed by 3 degrees, just one more degree than currently? According to scientists the effects would be calamitous. With eight out of the 10 largest cities near a coast, several millions would be at risk of flooding, shoreline erosion and storm surges. According to a recent Guardian article, the worst-hit cities would be in Asia, including Shanghai, Hong Kong and Osaka. Rio de Janeiro, Miami, The Hague, and Alexandria are also included among the most populated, at-risk cities. Osaka in a 3-degree world would disappear underwater, while in Alexandria, the Egyptian city's beaches would be submerged and 8 million people would be flooded out. The impacts of sea-level rise will vary by location and depend on a range of biophysical characteristics and socioeconomic factors, including human response. The primary impacts of sea-level rise are physical changes to the environment. These changes, in turn, affect human uses of the coast such as tourism, settlement, shipping, commercial and recreational fishing, agriculture, and wildlife viewing. The most serious physical impacts of gradual sea-level rise on coastal lowlands are (1) inundation and displacement of wetlands and lowlands; (2) coastal erosion; (3) increased vulnerability to coastal storm damage and flooding; and (4) s­alinization of surface water and groundwater. If no safeguards are put in place, we can expect $1 trillion in damages every year in 136 of the world's largest cities. A 2008 study quoted by Scientific American found 2,400 miles of major roadways would be underwater along the Gulf Coast if the ocean rises four feet. Three airports, 246 miles of railways and three quarters of freight facilities would also be submerged. Thankfully, some cities, states and companies are taking matters into their own hands before the storm waters come. After Hurricane Irma, the largest power company, Florida Power and Light, saw outages to 90% of its customers. But the grid was restored within two days due to the state's power companies earlier strengthening the grid. Hardening measures included concrete power poles, enhancing main lines, and installing “intelligent” devices that detect power problems. Duke Energy spent around $2.4 billion to strengthen its grid including replacing 802,000 power poles. As mentioned earlier, New York is working on several flood-prevention projects including a U-shaped berm around the Lower East Side – thus shielding 10 miles of coastline with salt-resistant vegetation – a breakwater on Staten Island, and a flood prevention plan for Southern Nassau County. In Rotterdam, the Dutch city has for the past 56 years been building up a series of dikes, dams and drains to curb flooding. But the most impressive points out Mashable, are the floodgates. At 72 feet wide and 688 feet long, the floodgates were built in the 1990s, and automatically open and close to allow ships through. Closing the gates prevents flooding and storm surges. Da Nang, Vietnam helped residents to build more flood-resistant homes; in Surat, India, the city developed a flood warning system; and in Semarang, Indonesia, a flood forecasting system predicts when floods will likely occur and where. Salt marshes and mangroves trap sediment and organic matter, allowing them to grow in elevation. That affords rising protection against inundation... And according to National Oceanic and Atmospheric Administration, just 15 horizontal feet of marshy terrain can absorb 50 percent of incoming wave energy. hunger and dehydrations. Toilets broke or ran out of water. The unhygienic, unsafe conditions led to chaos and crime. In the aftermath, legislation was passed to repair storm-damaged sewage treatment and drinking water plants and to provide hurricane assistance to Louisiana, including $5 billion for water infrastructure projects. According to a Congressional report, over 1,220 drinking water systems and over 200 wastewater treatment facilities were affected in Louisiana, Mississippi and Alabama. Drinking water and sewage service for over a million customers was severely disrupted in New Orleans. Another less-known effect of coastal flooding is saltwater inundation. Saltwater inundation is what happens when ocean water infiltrates fresh water aquifers, which can lead to contamination. Imagine drawing a glass of tap water and when you take a sip, the water is salty. Saltwater inundation can occur when groundwater aquifers run dry and the fresh water is replaced by salt water that migrates into the aquifers from the ocean. Primary causes are overpumping of fresh water, a lack of rainwater flowing into aquifers, and storm surges caused by rising sea levels. Areas where saltwater inundation is a concern include New Jersey, Savannah Georgia, Miami, Tampa Bay, and Los Angeles. In Florida the ocean is already starting to seep into swamp land, which weakens the plants from their peat bedding. “When we start to lose the structure of the plants, essentially this peat, which is otherwise held together by roots, becomes a soupy pond,” explains a University of Florida researcher in an NPR article. Millions of people in South Florida get their fresh water from the Biscayne aquifer in the Everglades. by drinking high-salinity water. High river and soil salinity in Bangladesh is also predicted to reduce rice crop yields, affect the productivity of fisheries, crack road surfaces, and increase poverty. Climate change is depleting the world's fresh water resources in other ways, too. As the snow cap declines in areas where rivers depend on the freshet, those rivers are shrinking. The best example is the Colorado River, where warmer weather and lack of precipitation have reduced flows by nearly 20% between 2000 and 2014. A study by the University of Arizona predicts that climate change will pull groundwater out of four economically important aquifers at a higher level than they can be recharged. This is because the Southwest region in particular is expected to become drier and hotter. They include the aquifers of California's Central Valley, and the central and southern portions of the High Plains and Arizona’s San Pedro aquifers. Already, warmer-than-average evening temperatures in feedlots in southwest Kansas mean that beef cattle drink more water than they did in cooler years. As more farmers return to dryland farming, large farms are likely to swallow smaller family farms, because dry farming, with lower yields, requires more land to be profitable. Irrigation will disappear from most places, so more small towns will fade away. Countless towns across the Plains already teeter on the brink of extinction. The problem is global. According to two studies led by the University of California, Irvine, using data from NASA satellites, a third of the world's aquifers are being rapidly depleted by human consumption. The three being diminished fastest are the Arabian aquifer (a water source for 60 million people), the Indus Basin aquifer of northwestern India and Pakistan, and the Murzuk-Djado Basin in northern Africa. Despite the shift to renewable energies and all the hype over electric vehicles, the world still uses a lot of oil – over 35 billion barrels a year according to the IEA, which predicts the current 97 million barrels a day will rise to 100 million bod by 2021. What is the connection between oil and climate change? The answer is probably easiest to see by playing with the maps located here. The majority of US refining capacity is clustered along the Gulf Coast and the Northeastern Seaboard, which also happen to be the area’s most prone to sea level rise and storm surges either caused or made worse by a warming planet. That's because refineries need to be built close to ports and tankers. A few examples: Valero Energy, the largest US refiner, has nine refineries on US coasts. Of the 11 refineries owned by Phillips 66, three are on coasts. Exxon Mobil has three major refining facilities on the US Gulf Coast, one of which – Baytown, TX – was shut down during Hurricane Rita. A 2015 report from the US Department of Energy found that “climate change is likely to substantially increase the vulnerability of many energy facilities in the coming decades. As recent hurricane events have demonstrated, this study found that an extensive amount of U.S. energy infrastructure is currently exposed to damage from hurricane storm surge.” By extensive, the study means up to 34 refineries, or 8% of current capacity, are currently exposed to storm surge inundation from Category 3 hurricanes. The report says that the Strategic Petroleum Reserve is highly vulnerable due to its proximity to the Gulf of Mexico, and 80 to 100% of US refining capacity is exposed to storm surges. The Union of Concerned Scientists urged oil companies to be more transparent about their risks from climate change and said investors should press companies to consider such risks and to take measures to prevent them, including getting refineries to conduct risk assessments, according to a 2015 report. However E&E News, which reported on the dangers of flooding to refineries the same year, said none of the refiners mentioned in the Union of Scientists report discussed the impact to its operations from climate change in filings with the US Securities and Exchange Commission – despite calls from investors to do so. While many oil companies are staying mum about their plans to address sea rises and other unsavory climate-change-related topics, at least one has taken action. In 2014 the Delaware City Refining Company stated that its shoreline is rapidly disappearing, due to tidal encroachment. The solution? Build a protective ring of buoys “that has the resilience to deal with Sea Level Rise (SLR) for at least 50 years,” Gawker reported. However, in an amusing twist, a later article stated that the company was trying to get taxpayers, through a federal program, to pay for shoreline protection. We know that planet earth is warming, and we've shown that the seas are rising, slowly but surely. We don't need or want to get into the reasons why, but the fact is that climate change will have an effect on our water, and likely our oil supplies, in coming years. We've already seen refineries shut down during major hurricanes, which affects supply and hikes the prices of refined oil products like gasoline and heating oil. We've also witnessed the devastating effects that these storms have had on our water infrastructure. Damaged water and sewer pipes took weeks to repair, leaving some of the poorest and most vulnerable citizens lacking basic sanitation and drinking water. Fresh water is also depleting due to saltwater inundation caused partly by rising sea levels, while farther inland, aquifers are being drained due to overuse – a problem that will be exacerbated as temperatures rise. We don't mean to be alarmist, but a further consequence of climate change could involve money, or more to the point, access to funds. As cities flood, due to storm surges or rising seas, more residents will be driven out of their homes and could even become refugees, as we saw during Hurricane Katrina, when thousands of people were stuck in a crowded stadium without adequate water, food or sanitation. Calamitous times call for safe havens, and what better safe haven than gold? Gold doesn't require cash machines, it isn't affected by inflation, and it is highly portable and tradeable if cash suddenly becomes scarce. Like everyone else I'm watching and listening to the evidence of global warming, but I'm not running for the hills. Rather, I'm looking for other investment opportunities that might profit from climate change. And I’ve got a few on my radar screen. Do you?